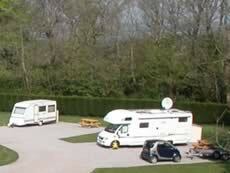 Give your Holiday Park business a competitive edge by using the advantages of Portable High Mast Photography. When you use this technique you can really show off your Holiday Park at its best and let your customers see all the benefits and facilities you have to offer on your site. High Level Photography gives your promotional publicity a whole new dimension. 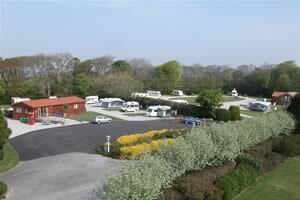 Above the same Holiday Park has been photographed from ground level and from High and Wide's Elevated Digital Camera. 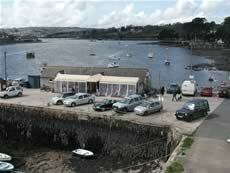 As you can see the ground level shot only offers a limited view of the location and facilities on offer. 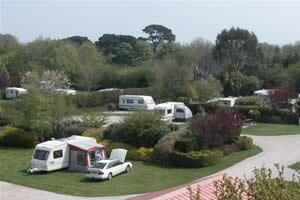 In comparison the Elevated View allows your customers to peek over the hedge and have a look around to see your quality Holiday Park and all you have to offer in its beautiful Cornish location. The nature of your business is similar to the running of a small town. High Level imagery allows you to show the full spread and dimension of your site to best advantage. These pictures are captured by remote controlled digital cameras with high quality optics and sensors and allow your Holiday Park to be fully appreciated and will give your promotional publicity an attractive flair. Because we shoot our photographs from a tall extending mast, the camera's perspective allows customers to see tantalising glimpses of the natural location that surrounds your site. This gives the benefits of allowing them being able to spot the best pitches for their kind of holiday and encouraging them to see the need to book early. 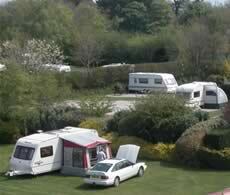 It also demonstrates the tranquil and stress free nature of your Holiday Park which can be useful for those businesses seeking to extend their booking season. 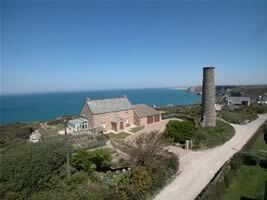 Andrew Tweedie has worked as a Professional Photographer throughout Cornwall for about 30 years. When you contact him, he will know your area and will probably be able to envisage the best approach to photographing your site to maximise it's good features and impress your potential holiday visitors. Because of his extensive experience in Cornwall, Andrew will know the best weather conditions to shoot your site and will be willing to synchronise a snap visit when that clear window of fine weather opens up. Advertising is expensive and takes up a large part of any business's budget. Therefore it is important that the money spent will bring the desired results. Elevated Photography is a cost effective choice for Holiday Park businesses. 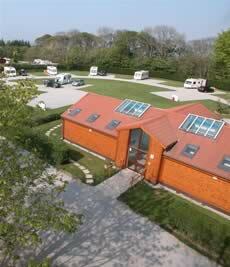 For example, High and Wide's elevated photograph of the Polgooth Holiday Park near St Austell, Cornwall, was used as part of a full page editorial feature in the internationally distributed Blake's catalogue. It is much cheaper and more flexible than aerial photography and brings all the benefits of an oblique or bird's eye view as opposed to the limitations of ground level shots. Vibrant and interesting visual images such as can be captured by High and Wide's Elevated system can speak to the imagination of your target customers and and strengthen the feeling of 'being there' as they browse your brochures and choose to book. Another perspective on this is that if you have impressive photographs taken from an unusual angle Sunday supplements and Travel Writers are more likely to feature your Holiday Park in their articles and features. High Level Photography will make your business stand out from the crowd, attract more custom and allow you maximise your return on your large advertising expenditure. Top.